If you call something the best, it has gotta be the best, right? 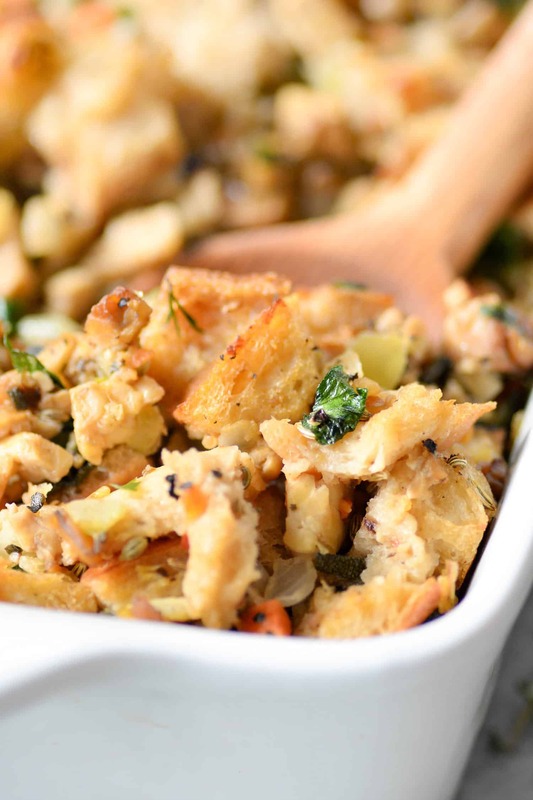 Well, this is the best vegan stuffing out there. Maybe the best stuffing ever? I don’t know. You be the judge. I’ve basically taken my mom’s stuffing recipe and swapped in homemade tempeh sausage crumbles for Italian sausage. Promise me you will try these sausage crumbles, even if it’s not in this stuffing. Isa first taught my how to make them and I’ve been adding them to countless recipes ever since: pizza, pasta, egg bakes, tofu breakfast tacos– you get the drift. The secret is adding in fennel seeds and sage; those two spices alone make this sausage taste more like Italian sausage and less like tempeh. Promise me these crumbles will make an apperance in your house soon, OK? To begin, we’re sautéing the holy trinity of carrots, onion and celery in glorious butter. Well, vegan butter. I’m obsessed with Earth Balance and use it in just about everything, but any butter will work. I prefer EB because it’s non-hydrogenated margarine which means you get the non-dairy factor without any added trans-fats. Please use butter or vegan butter here, coconut oil or olive oil just doesn’t have the same taste. At least, it didn’t to me when I tested those options. Then we fold in the sausage crumbles and lots of toasted sourdough bread. Day old bread isn’t enough, the bread should be very dry and crouton like. To ensure that each piece is toasted enough, cube it and then bake in the oven until dried. Fresh herbs are a must, so I included a heavy hand of sage, thyme and parsley. Don’t substitute dried as it won’t work the same way. Plus, it’s Thanksgiving and I think it’s OK to spend a few dollars on yummy fresh herbs; use any extras in cocktails pasta, or freeze for later. Lastly, add the vegetable broth and let sit to ensure that the bread soaks up everything before baking. Start slowly, you can always add more if needed. I like to begin with two cups of broth, then add a tablespoon or two at a time until perfect. The bread should be lightly moist, but not wet. If it’s too wet, it will bake into a soupy mess. It’ll still be delicious, but stuffing should be moist, not wet. 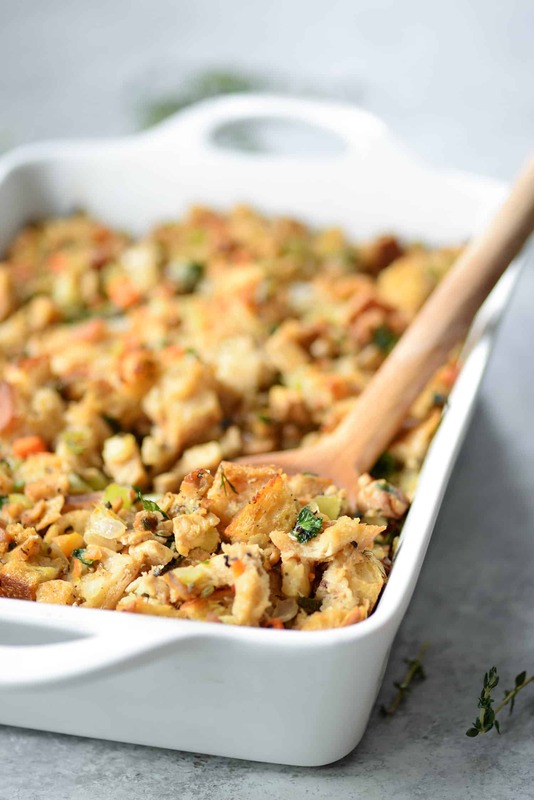 Looking for the best vegan stuffing? This is it! Homemade tempeh sausage crumbles folded into a classic stuffing with sourdough bread, carrots, celery, onion, thyme and sage. Vegan. Crumble the tempeh using a box grater or finely chop using a knife. Add to the skillet along with 1/4 cup water. Let steam until all water is absorbed, stirring occasionally. You can make this ahead of time for easy prep. Make as directed the day before, then cover with foil and chill in the fridge until ready to bake. 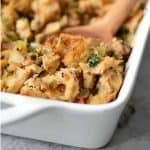 This recipe looks great and I’d like to try it out for thanksgiving this year! Would you be able to estimate about how many cups it makes? Thanks! I didn’t measure this in cups, but it fills a 9×13″ pan nicely (as shown in the photos.) I’d estimate about ~10 cups in the finished recipe. Thanks! Just trying to decide if we should double it for our party of 15! I would definitely double it and use two pans. I haven’t doubled it, but I’m sure it will work fine. I’d watch how much liquid you add, erroring on the side of too little to too much. Enjoy! D I substitute a loaf of gluten free bread for the sour dough? I haven’t done it, but yes, I think so. Let me know how it works out! If I’m halving the recipe; how would you recommend I adjust the baking times? Hi Julia, I haven’t halved this one before- but if I was going to, then I would keep the baking times as a start, and use a smaller pan (like an 8×8). Check it after 30 minutes; then see if you need to remove and cook an additional 10-15 minutes. The last few minutes of baking time are just to get the top nice and crispy. That’s perfect! I use soy tempeh all the time. And yes, I think mushrooms as an addition would be fantastic. Hi Lauren, red wine will change the flavor of the stuffing and the color; I would just use more vegetable broth to deglaze. This tempeh sausage is very yummy. I didn’t make the stuffing since the holiday is over, but I wanted to try the sausage. I served with with potatoes and salad for dinner, and then added it to a leftover vegetable garbanzo soup in our fridge. The soup is quite good with the added energy of spicy sausage. I will definitely make this sausage again. Glad you liked it! We LOVE this sausage as well! I absolutely love this! It’s my go-to holiday dish and no one can tell there’s tempeh in it. Everyone always loves it and I could eat the whole pan to myself 🙂 Last time I made it, I added about 5 oz of chestnuts to it because I personally love chestnuts! Turned out great! Thanks for a delish recipe! So glad you liked it! Thanks Evelyn! This recipe looks great! I would like to make it for Easter tomorrow and wasn’t sure if I should bake it tonight and bake it again tomorrow? I wasn’t 100% clear on what you meant in your note about preparing it the night before. Thank you! Sorry I’m just getting to this now- you can make the entire thing ahead of time without baking. Cover, then remove and bake as directed. Thanks!